On a stormy night two hundred years ago, a young woman sat in a dark house and dreamed of her life as a writer. 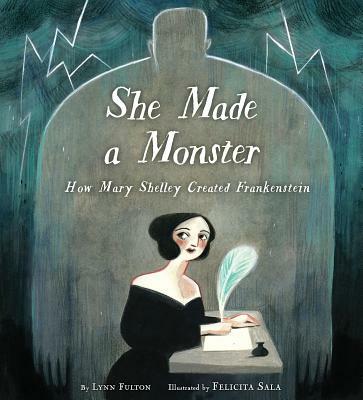 She longed to follow the path her own mother, Mary Wollstonecraft, had started down, but young Mary Shelley had yet to be inspired. As the night wore on, Mary grew more anxious. The next day was the deadline that her friend, the poet Lord Byron, had set for writing the best ghost story. After much talk of science and the secrets of life, Mary had gone to bed exhausted and frustrated that nothing she could think of was scary enough. But as she drifted off to sleep, she dreamed of a man that was not a man. He was a monster. Lynn Fulton loves reading and writing so much that she got a PhD in English. She has worked as an insurance investigator, middle school teacher, and writing tutor, and has had numerous hobbies besides writing books, such as painting pictures, designing T-shirts, practicing German, trying to learn Spanish, and playing terrible piano. She lives in the San Francisco Bay Area with her husband and teenage son, plus a dog, cat, and bunny. Felicita Sala is a self-taught illustrator who studied philosophy at the University of Western Australia. She has worked on several animation projects, but her passion is making picture books. Her previous books include Joan Procter, Dragon Doctor by Patricia Valdez and I Don't Draw, I Color! by Adam Lehrhaupt. Felicita lives in Rome with her husband and their daughter. Visit her online at FelicitaSala.com. Follow her on Twitter at @felicitasala and Instagram at @felicita.sala.